Pages: 328 Dimensions: 8.5" x 11" x 1" Weight: 2 lbs. 403B Critical Thinking Handbook: 6-9th Grades $9.95	 Qty. 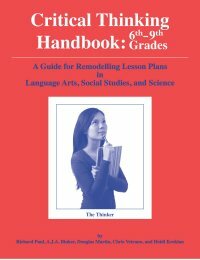 The four grade-level handbooks in this series can be used either as the basis for critical thinking staff development, or as an independent resource for teachers. Starting from standard lessons and standard practice, the teacher sees, in case after case, what the weaknesses are in standard lessons and how they can be remedied. A book from this series is an essential resource for any teacher serious about fostering the critical thinking of students.